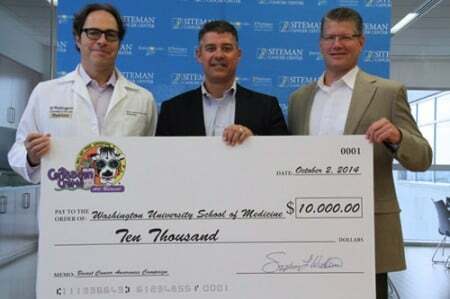 The $10,000 check to the Siteman Center Center represents the collective fundraising efforts from the Caribbean Crème national retail network during Breast Cancer Awareness Month in October. The proceeds were generated from the sale of pink embossed cups and Caribbean Crème’s Sour Watermelon smoothie. The funds were earmarked for the Siteman Cancer Center at the Washington University School of Medicine in St. Louis, MO. These funds will be spent directly on breast cancer research. At Siteman, the results of basic laboratory research are incorporated into treatment advances. Caribbean Crème thanks everyone involved in making this drive a success.